The man was reportedly armed with a knife and running in and out of traffic when he was shot just before 10 a.m. The owner and an employee of a Lynnwood carpet store recalled the strange encounter they had with a young man who came into the business Monday morning, asked to use the restroom and launched into an odd rant. 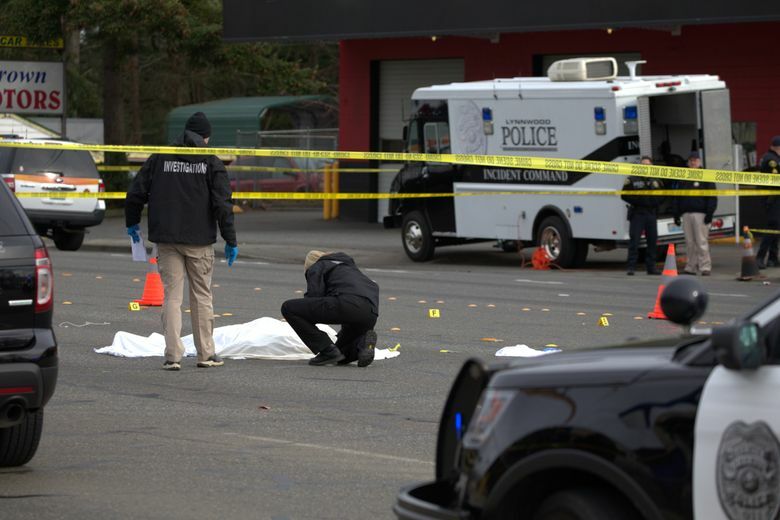 Minutes later, the man was fatally shot by Lynnwood police as he darted in and out of traffic on Highway 99. Police said the man had advanced on officers while holding a knife and ignored repeated commands to drop the weapon. Dave Schultze, owner of Western Carpet Center in the 19200 block of Highway 99, said he was making coffee when his employee, Evan Wickham, escorted the man to the back of the store where the restroom is located. Wickham said on the walk through the store, the man immediately started making odd comments and referencing the Middle East. Schultze, 63, said he saw “the frightened look on Evan’s face” and asked the man to leave. But he refused. “He’s being a little combative, and this is looking kind of dangerous,” recalled Schultze, who returned to the front of the store and called 911. “I did hear him say he knows we’re trying to kill him, and his parents particularly are in danger. “He was being quite annoying, wanting to discuss his issues,” Schultze said. Whickham tried to keep the man calm and get him out the door when a phone call came into the store on another line and Wickham went to answer it, Schutlze recalled. The man turned around and walked out, saying, “Have a great night” as he left, Whickham said. Schultze got off the phone and poked his head out the door, but he couldn’t see the young man. Worried the man might have circled to the rear of his building, Schultze ran around to lock the back door. As he returned to the front of the store, Schultze saw patrol cars arriving and saw the young man leave a muffler shop two doors away and take off northbound. “He saw the police arrive and ran in and out into traffic, then into the Costco parking lot, then back into traffic,” Schultze said. Schultze was too far away to hear any of the officers’ commands but said he heard six shots, followed by a pause: “He was still running around, then there were a few more shots. Then the next thing I saw was them trying to revive him,” Schultze said. According to a news release issued Monday by police, officers responded to the 911 call about a man yelling and acting hostile inside the business just before 10 a.m. When police contacted the man, he ran out into the highway several times as the officers tried to de-escalate the situation, according to the release. One officer reported the man was armed with a knife, and was advancing on officers, it says. Their commands were ignored and the man continued to advance, at which point one officer opened fire at 9:48 a.m., killing the man at the scene, the release says. Police say they recovered a blade from the man. He is believed to be in his 20s. 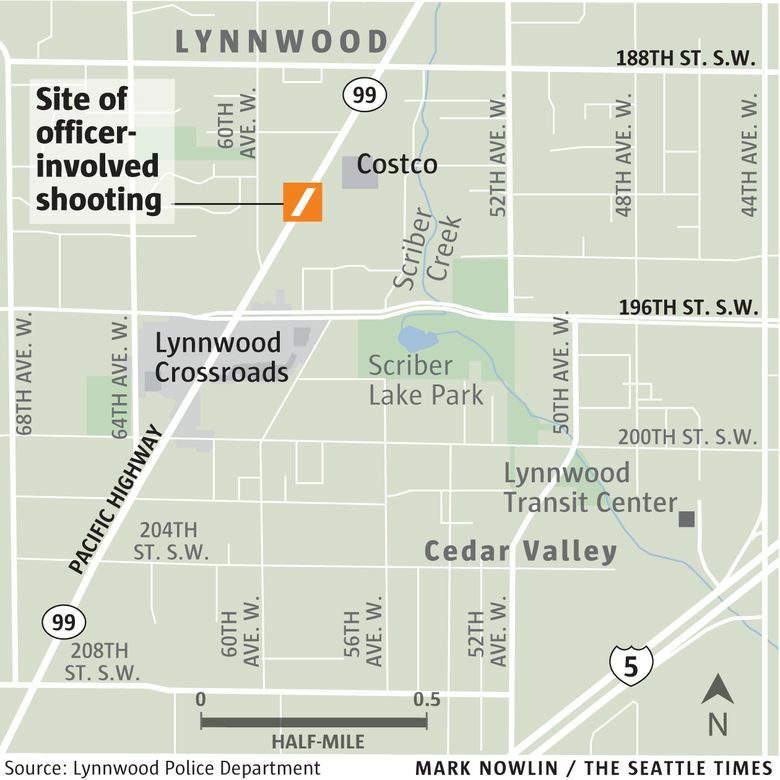 The officer who fired has been with the Lynnwood department for three years, according to the news release. The officer has placed on administrative leave during the investigation. Highway 99 was closed in both directions between 188th Street Southwest and 196th Street Southwest for several hours as police investigated the shooting. The street was reopened around 4:30 p.m. Monday. The Snohomish County Multi-Agency Response Team, made of detectives from various law-enforcement agencies, is investigating the shooting.